Carl Tuckett unveils the road sign in his honour on February 03, 2015. 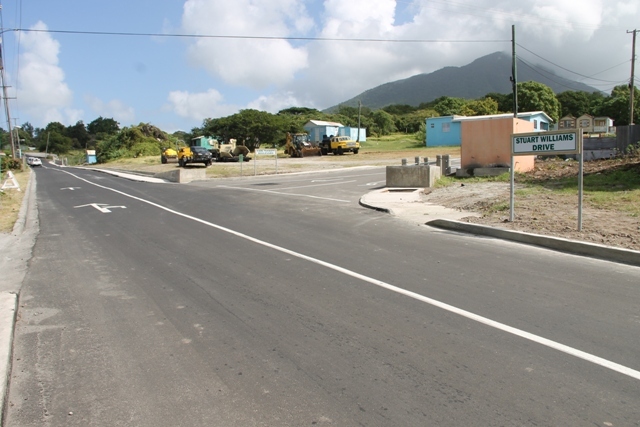 NIA CHARLESTOWN NEVIS (February 04, 2015) — Stuart Williams and Carl Tuckett, two of Nevis’ sporting heroes will never be forgotten, now that two refurbished roads were renamed in their honour at a ceremony at “Bocco Park” on February 03, 2015. 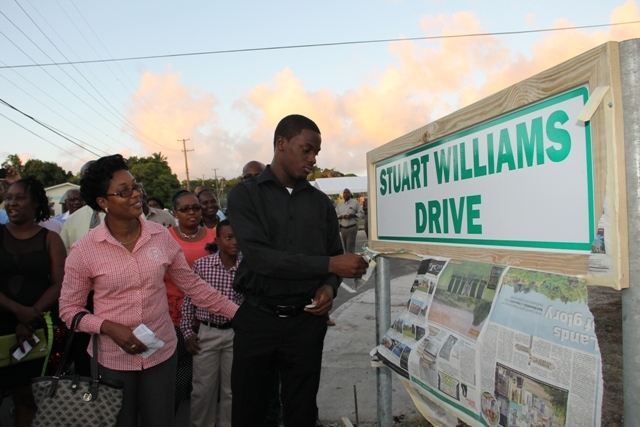 Williams’ son, Saeed Williams unveiled the sign bearing the name Stuart Williams Drive which extends from the southern end of what was formerly the Charlestown bypass. 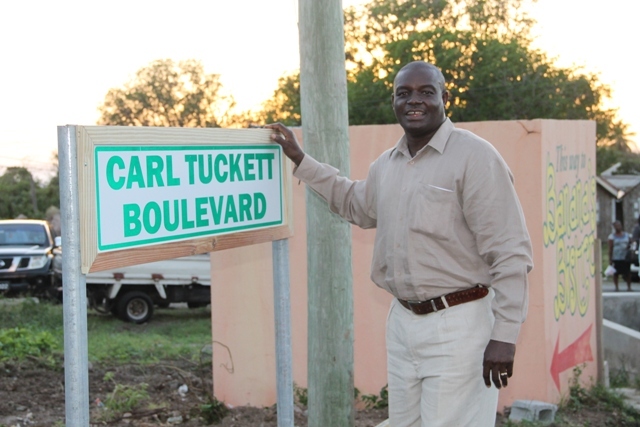 Tuckett unveiled the sign bearing the name Carl Tuckett Boulevard which leads into Hamilton from its intersection with the Stuart Williams Drive. In response to the accolade, Tuckett who also spoke on behalf of Williams who was off island with the West Indies Cricket Team, said he was honoured and humbled for the accolade but stated that he was accepting the gesture not for himself but with the hope that it would serve as a beacon of encouragement to the future young cricketers of Nevis. “I want every one of you to play for the love of your country and not for yourself. Keep out of trouble. Stay away from drugs. “I did not start out with the aim to have a road named after myself and Stuart. I gave my all and my best because of the love and passion for the game of cricket,” he said. Tuckett thanked the Nevis Island Administration (NIA), both former and present for their support with their cricketing careers over the years. He said he was aware that cricket was a team sport and he also extended gratitude his team mates of the Nevis Leewards Masters and the West Indies team and to his first coach Elquemedo Tonito Willett whom he said had paved the way for both himself and Williams. Tuckett also thanked the Almighty God for the talent he had bestowed on them and the opportunity he had afforded them to be ambassadors for their island home, Nevis. He also thanked his parents Janet Nicholas and Ian Johnny Wallace, his late aunt Gertrude whom he said raised him and gave him the foundation of encouragement to always follow his dream. Tuckett thanked his wife Sonia and son Carlon, whom he said were his biggest fans, for their support throughout the years especially when he had to be away from home. He expressed gratitude to his Pastor Eric Maynard and the members of the Shiloh Baptist Church for their prayers. He also thanked his supporters, friends and the Nevis public.